BRAND NEW EVENT! 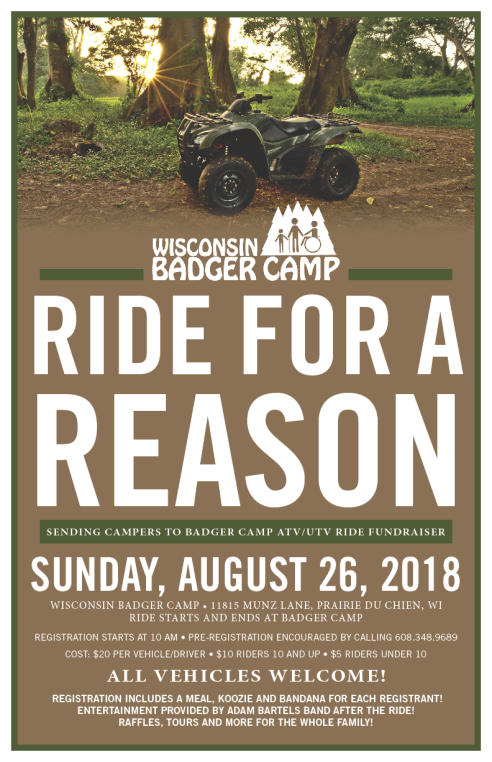 We are VERY excited for our first ever Ride for a Reason fundraiser for Badger Camp! If you know that you plan to attend, please let us know because it helps with food and item orders! (608) 348-9689. We want to give a BIG SHOUT OUT to our sponsors! Allegiant Oil LLC, Ritchie Implement, Bloomington Meats, Economy Feed Mill, Luck O’ the Irish Bar, New Horizons and River of Lakes Campground! Thank you so much for your wonderful support! -We plan to have a couple of options in terms of routes, but the routes will visit towns including Bagley, Glen Haven, North Andover, Mount Hope and Patch Grove. We are going by the Grant County ATV/UTV map (see map photo). There will be punch cards so that riders are encouraged to visit as many businesses listed on the card as they can during the ride with opportunities to win cash prizes! If you choose to cut your ride shorter, that is perfectly fine. -Registration begins at 10:00 a.m. on Sunday, August 26th at Badger Camp (Prairie du Chien). We will take off at 11 a.m. We plan to get back around 3:00-3:30. Food will be available at that time and the Adam Bartels Band will start! -We will have raffle opportunities at Camp and 50/50 along the routes as well as more fun! If you have any questions, please feel free to call us at (608) 348-9689. We hope to see you there, we are excited for this event!